The favorable weather conditions had settled in September in Primorsky Krai, Russia, made it possible to receive the quality images of the celestial body and to get the unique material for its further research. The FEFU scientists are currently preparing an article for publication in one of scientific journals. Far Eastern Federal University (FEFU) scientists together with astrophysicists from all over the world are observing the Comet 21P/Giacobini-Zinner approach to the Earth. Observation work is conducted by a group for space research led by the lead scientist Evgenij Zubko, Ph.D., Docent. The team formed in the School of Natural Sciences, FEFU and consists of the young scientists of the University: graduated student Alexey Matkin, PhD-students Ekaterina Chornaya and Anton Kochergin and the researchers at the Ussuriysk Astrophysical Observatory Maxim Zheltobryukhov and Gennady Kornienko. Researchers have noted that the study of comets provides an opportunity to obtain new information on microphysical properties of cometary dust. The study of the smallest, submicron- and micron-sized dust particles plays a key role in the whole research process. Its results help to learn about the history of the formation and development of the solar system. "The uniqueness of the situation is that the phase angle for our observation of this particular comet was as high as 80 °. In other words, we had been looking at the comet in its "profile". Such geometry of observation made it possible to measure very precisely the distance for which the cometary dust particles were ejected towards the Sun; the so-called stand-off distance. Thus, having a very accurate measurement of the coma extension towards the Sun, we can calculate with high accuracy the velocity of the dust-particle ejection and, furthermore, the effect of the solar-radiation pressure on deceleration of their motion. Now we are analyzing these data," commented on Evgenij Zubko. "One of our results is a highly detailed image of the comet, obtained by combining 20 frames taken consecutively. There are also tracks of the stars in the picture – their stretched images. 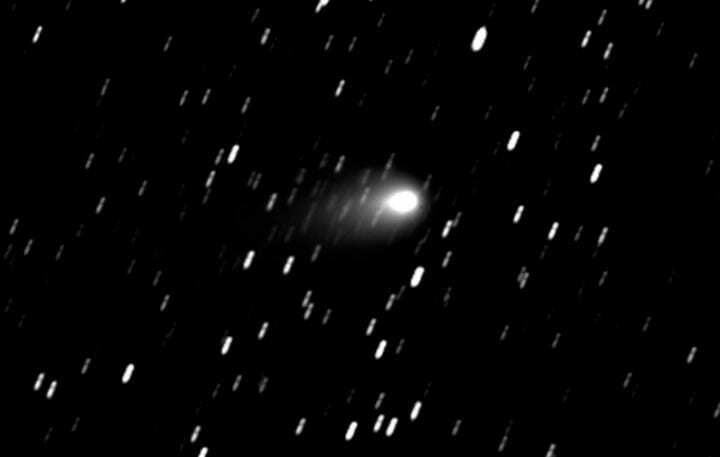 This results from the fact that the comet was moving against the background of static stars, while the telescope was following the comet, not the stars," explained graduate student Ekaterina Chornaya. FEFU astrophysicists led by Evgenij Zubko are engaged in several research projects as part of international teams. Their previous findings are published in such scientific journals as Icarus, Monthly Notices of the Royal Astronomical Society, Astronomy & Astrophysics, etc. Currently, their partners are the University of Granada, the Institute of Astrophysics in Andalusia (Spain), Space Science Institute (USA), and the Astronomical Institute of the Slovak Academy of Sciences (Slovakia).